Physiotherapy is an amazing tool that can help alleviate pain from injury or illness. It is a powerful process through which you can improve the quality of your life. Physiotherapy is a treatment delivered in various streams of healthcare across Canada. This type of treatment is not limited by age in any way. 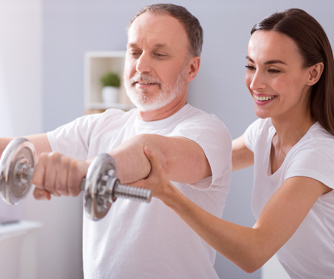 The end goal of this treatment is to restore basic function and mobility through targeted stretching, therapy, and exercise and incorporates many disciplines, including massage therapy and acupuncture. This treatment is not limited to the rehabilitation of physical injury. Its benefits are spread across a number of common illness and conditions. For example, 90% of Canadians possess at least one risk factor for heart disease. Physiotherapists provide a treatment referred to as cardiovascular rehabilitation or CR. CR combines physical, social and educational tools to improve a patient’s quality of life. Our team of therapists will assess your needs based on a number of factors. They will evaluate your physical performance, and check any relevant medical records. From there, they will work with you to prescribe an appropriate treatment plan. Physiotherapy has been to know to show benefits not only in the treatment of acute injury but in long term illness such as arthritis as well. The first step centres around appropriate diagnosis and understanding of your injury or illness. One of our four physiotherapists will perform a full physical examination of you, taking note of any relevant medical records or doctors references. They’ll test flexibility, range of motion, reflexes, and more. The next step is the treatment plan. A key part of physiotherapy is harnessing the body’s natural healing abilities. Personal exercise plans could include stretching, low impact, or regular exercise. All of which with one goal in mind – restoring basic function to the affected part of your body. Therapists look at the body as a whole – not just the affected area. They may prescribe an exercise or alternative therapy like acupuncture in an area that is not in pain. Remember, your body is a cohesive machine- each component is interconnected with the rest of the body. Through targeted needling we can reduce inflammation, ease pain, and help the body heal. A massage not only feels good, but encourages bloodflow throughout the area promoting both healing and rehabilitation. An auto accident introduces tremendous stress on the body. If you're hurting, we can help. Utilizing multiple treatment modalities we get to the root of your pain. Millions of Canadians rely on effective physio to help them move and feel better. Improving mobility, increasing range of motion, and reducing pain are the prime objectives of post-surgery physiotherapy. Whether your injury is major or minor, getting hurt on the field is frustrating. We can help get you back in the game.